Holding that a fee amount claim by a lawyer based on percentage of subject matter in litigation cannot be the basis of a complaint under Section 138 of the Negotiable Instruments Act, the Supreme Court in B. Sunitha vs. State of Telengana, quashed such a complaint filed by a lawyer against his client. A Supreme Court bench of Justice Arun Mishra and Justice Mohan M Shantanagoudar on Wednesday ruled that Anatha Shishu Sevashram, a public charitable society based in Bangalore, by repeatedly approaching the courts of law in a land acquisition dispute for almost the same relief which was negated by the courts for three decades, has committed contempt of court. The Supreme Court has observed that a judicially separated wife is also entitled for maintenance. The wife had approached the apex court after the order granting maintenance by the trial court was set aside by Patna High Court. The Supreme Court, in Gorakh Nath Prasad vs State of Bihar, held that mere fact of an FSL report being available is no confirmation either of the seizure or that what was seized was ganja, in the absence of the production of the seized item in court as an exhibit. The Supreme Court held that certificates issued by the Grama Panchayath secretary in Assam can be used as a ‘supporting document’ for claims of inclusion in the National Register of Citizens (NRC), though the certificate by itself is not a proof of citizenship. The Supreme Court, in Kamalakhya Dey Purkayasth vs Union of India, held that citizens who are originally inhabitants/residents of the State of Assam and those who are not are at par for inclusion in the National Register of Citizens (NRC). The Supreme Court sentenced a murder case accused to two months’ imprisonment, finding him guilty of contempt in getting himself admitted to a hospital when there was no medical reason to justify such an admission and in continuing to remain admitted to evade arrest. The Supreme Court, on Monday, stayed execution of death sentence awarded to Tahir Merchant, one of the convicts in 1993 Mumbai bomb blasts case. The Supreme Court, on Friday, ruled that giving lift to strangers to later stole the vehicle is not a breach that would nullify the insurance policy. The Supreme Court set aside a Karnataka High Court order that had quashed defamation case filed against owner of a Kannada daily newspaper. A Supreme Court bench headed by Justice RK Agrawal reserved its decision on a plea challenging the anticipatory bail granted to Augustine Francis Pinto and Grace Pinto, trustees of Ryan International School, by the Punjab and Haryana High Court in the murder case of 7 year-old student Pradyuman. Supreme Court of India on Wednesday imposed a cost of two Lakh each to 12 States and Union Territories for not responding to the letters issued by Ministry of Women And Child Development as per the Supreme Court order. The Supreme Court disposed of a long pending appeal filed by the father of an Army man who went missing in 2005. A Bench of Justice NV Ramana and Justice S Abdul Nazeer observed that the state government and the Central government were not in a position to trace out the missing person and hence, no direction can be given in the matter. The Supreme Court bench of Chief Justice Dipak Misra, Justice DY Chandrachud and Justice AM Khanwilkar on Friday dismissed the writ petition filed by Ghaziabad primary school teacher Neeta Upadhyay praying for a common syllabus and curriculum for all children between the age of 6 and 14 years. The Supreme Court Bench headed by Chief Justice of India Dipak Mishra issued notice to Centre and states on a PIL filed by Vidhi Centre of Policy, seeking a direction to strike down 119 central and state legislation as they are discriminatory to people suffering from leprosy. The Supreme Court, on Wednesday, dropped contempt charges against the M.P. Housing and Development Board on a plea alleging that it was not providing reservation in promotions to the disabled. The Supreme Court set aside an Allahabad High Court that issued a slew of directions to Inspector General of Police (Law and Order) in the state, including holding of camp sitting on particular dates at particular police stations. 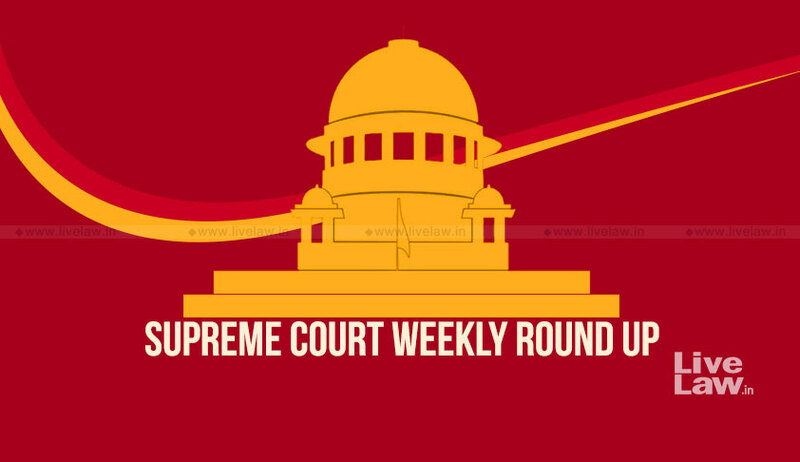 Supreme Court Bench of Justice Kurian Joseph and Justice Deepak Gupta, in an unusual order in a pending appeal, directed a woman to live with her husband for a few weeks and not to leave him without getting permission from it. The bench was considering an appeal filed by husband against the Punjab and Haryana High Court order that refused to grant him divorce. The Supreme Court bench of Justice AK Sikri and Justice Ashok Bhushan on Monday admitted and issued notice to the Centre and the Commissioner of Police of Delhi on a writ petition filed by the NGO Mazdoor Kisan Shakti Sangathan challenging the arbitrary and repeated imposition of police orders under section 144, CrPC by which, virtually, the entire Central Delhi area is declared a prohibited area for holding any public meeting, dharna or peaceful protest. The Supreme Court Bench of Chief Justice of India Dipak Misra and Justices AM Khanwilkar and DY Chandrachhud constituted a committee of two lawyers – Gopal Shankarayanan and Rishi Malhotra, and asked them to inspect those special schools and file a status report. The Supreme Court bench of Justice Madan B Lokur, Justice AK Sikri and Justice Kurien Joseph on Monday directed the Special Investigation Team (SIT), constituted under the apex court’s order dated January 23 to probe the prima facie involvement of former CBI director Ranjit Sinha in the coal block allocation scam, to submit its status report to the Court within four weeks. The Supreme Court directed the Central Bureau of Investigation to probe into the mysterious death of engineering student Jishnu Pranoy of Kerala. The Supreme Court, in B Sunitha vs State of Telangana, made a significant observation calling upon the government and the authorities to look into the issue of introducing requisite legislative changes for an effective regulatory mechanism to check violation of professional ethics and also to ensure access to legal services. The Supreme Court, on Thursday, referred to a larger Bench the question of applicability of Section 24 of the Right to Fair Compensation and Transparency in Land Acquisition, Rehabilitation and Resettlement Act, 2013. The Supreme Court On Friday directed Attorney General K K Venugopal to take instruction from the Centre by Monday as to what it planned to do regarding filling of vacancies in Central Administrative Tribunal and National Consumer Disputes Redressal Commission.